Its been quite a while since I’ve blogged last. This time I will be talking about my new pets. We got the baby rabbits a week and a half ago, but when we got them they were already about a month old. 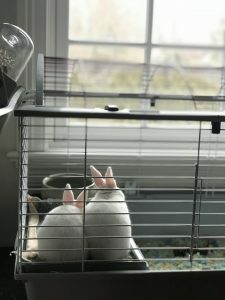 When my dad said that we were going to get pet rabbits, me and my sister did not believe him. We were so excited when we found out that we were actually getting them. Now that we have them, their names are Butterscotch ( his nick name is Butter) and Cream Cheese. Mine is Butterscotch and my sister’s is Cream Cheese. They are both white so we tell them apart by their sizes and their reaction when we pick them up. The one at the left is Cream Cheese and the one at the right is Butterscotch. Posted February 20, 2018 by schen25 in category Me!! This is Victoria. Cream Cheese and Butterscotch are so cute! I like how you put a picture in.